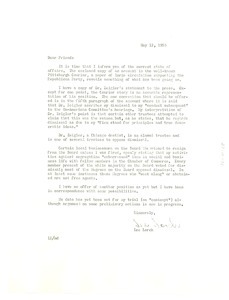 1232 results found for: genres:"Correspondence"
New York (N.Y.) - Explaining an enclosed copy of the "Victory Caravan Campaign." 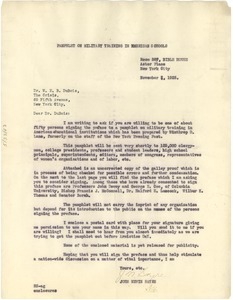 New York (N.Y.) - A request that Du Bois sign a pamphlet against military training in American educational institutions. New York (N.Y.) - Thanking W. E. B. 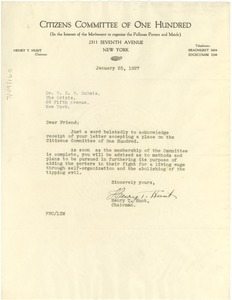 Du Bois for supporting the Citizens Committee of One Hundred. 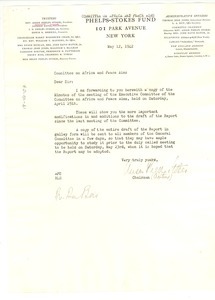 Signed by Henry T. Hunt, Chairman of the Committee. 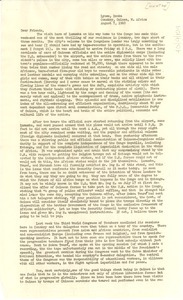 Conakry (Guinea) - Describing various highlights of the couple's three-month stay at Conakry; noting Lumumba's visit; the meeting of the Third World Congress of Teachers; social and political atmosphere in Guinea; the launching of a Three-Year Plan on Economic Development in that nation; and various related events and initiatives. 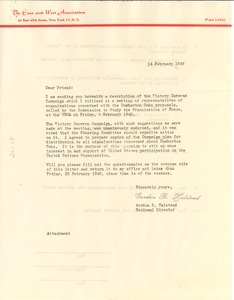 New York (N.Y.) - Signed Anson Phelps Stokes; addressed to the Committee on Africa and Peace Aims; enclosing a copy of the Committee's April 25 meeting and pledging to soon send a copy of the corresponding report. 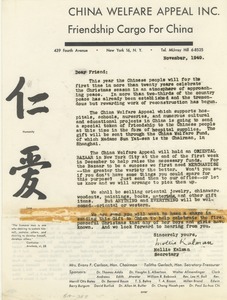 New York (N.Y.) - Signed Mollie Kalman, Secretary; describing the Appeal's charges and objectives, and inviting recipients to donate merchandise to a December "Oriental Bazaar" hosted "to help raise the necessary funds" for achieving these goals. Verso lists the organization's sponsors. 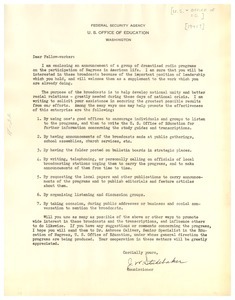 Washington (D.C.) - Signed J. W. Studebaker, Commissioner; addressed to "Fellow-worker"; enclosing an advertisement for the Office's new radio program and enumerating 7 ways to "help promote the effectiveness of this enterprise." 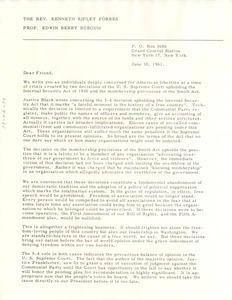 New York (N.Y.) - Describing many individuals' "deep concern for American liberties" at the current time of crisis and in the wake of the Smith Act; relaying the direct threats and nefarious impacts of the bill and similar legislation; enclosing a petition to the President; as well as a reply card seeking recipients' general support and contributions. 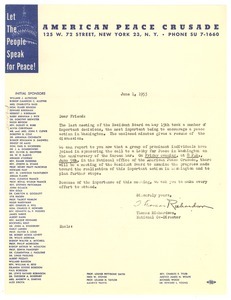 Signed by a couple dozen peace activists. New York (N.Y.) - Explaining the decision made to have a "Lobby for Peace" in Washington on the anniversary of the Korean War.